Charles Gagnon’s paintings remain something of a surprise and a discovery for those more familiar with the pillars of Montreal abstraction in its efflorescence through Automatism and two generations of Les Plasticiens. Esteemed for his lyrical abstract paintings and also for his work in photography, assemblage and film, Gagnon is unique. 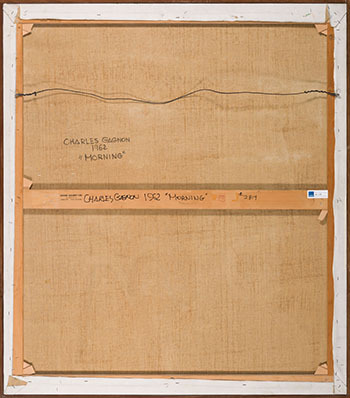 Where his fellow Quebec abstractionists – Paul-Émile Borduas especially – typically looked to and spent much more time in Paris than in New York City, Gagnon worked in the United States for five years, from 1955 to 1960. He kept abreast of work there and in Montreal; to his great credit, his painting drew from both contexts, but remained individual. Morning was painted not long after Gagnon’s return to Montreal from New York. 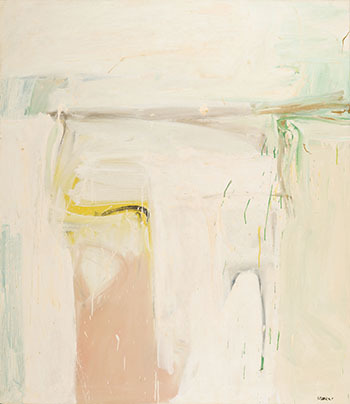 It is an expansive, airy and consummately subtle canvas. At first glance, the thinly applied paint reads almost as a monochrome, but the sense of sameness across the surface soon gives way to a realization of variations in tone, texture and colour moving together in a dynamic dance. Most of the surface is light in tone, making the green drips to the right and the yellow and black swatches in the middle left more outspoken. Because thin, smooth paint dominates, areas of relief – the drips again – are all the more noticeable. Much of the canvas exudes a flesh tone because of pink pigment subtending other, whiter shades. It is said that Gagnon’s abstraction stayed close to his observations of nature, to landscape in some cases. Unless one seeks the complete purity of non-referentiality that was promoted by some in the United States at this time, Gagnon’s translations of the world and its phenomena are a strength. Beginning with its title, Morning signals just this humanist entanglement with what we see and feel, whether it is dawn light or perhaps the hint of a horizon line and sun across the top middle of the canvas. If one is keyed to landscape as a genre as well as the external world of nature, there is even a recollection here of J.M.W. Turner’s late watercolour experiments using washes of pigment to evoke the fleeting effects of light. So radical were these paintings in the early nineteenth century that some were destroyed by Turner’s executor, John Ruskin. Today we are more able to enjoy their evocativeness. New York saw the intersection of Eastern as well as American and European culture in the later 1950s when Gagnon worked there. He has recorded his interest in Zen Buddhism at this time, specifically his fascination with the notion of the full, yet also empty, “void,” a concept that provides another key to this work. We may focus on the gestures here, on the movements of paint and colour. At the same time, though, we perceive the spaciousness of this painting, its lack of insistence that we see specifically this or that form. Since its inception in the early twentieth century and especially during the heyday of Abstract Expressionism that Gagnon learned from, abstraction has been promoted as a cipher of personal freedom. In Morning, that privilege seems to point to something beyond the individual. We thank Mark Cheetham, Professor of Art History at the University of Toronto and author of Landscape into Eco Art: Articulations of Nature Since the ’60s, for contributing the above essay.